How to Pack the Perfect Carry On For a Long Haul Flight! 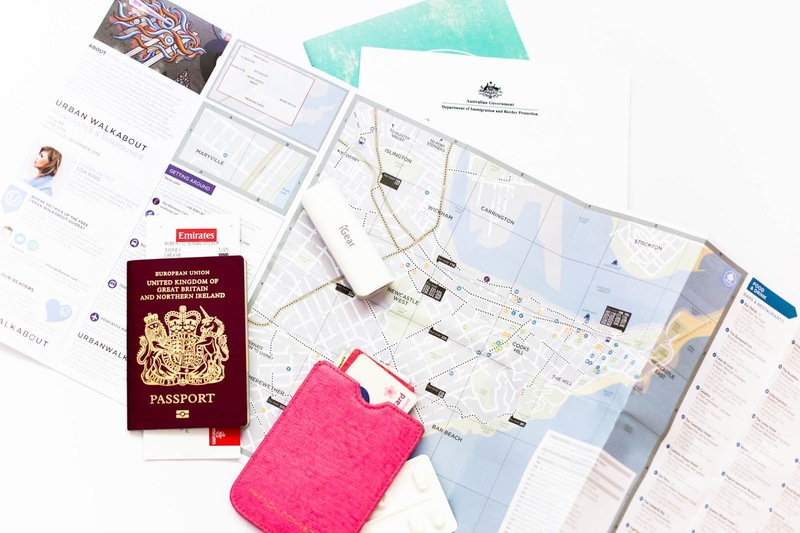 After landing in Australia last week for the second time in three months, it’s safe to say I’ve gained some experience in packing the perfect carry on, as well as frequent flyer miles. It doesn’t get much more long haul then London to Sydney, so making the journey as comfortable as possible is a priority, as is looking like a civilised human being when I’m reunited with Fraser at the other end! This simply comes down to a carefully packed, and well-equipped carry on bag. Long haul flights test all that it is to be a glamorous woman who understands the importance of perfectly harmonised jewellery and the power of a thin stiletto. Instead, leggings, dry shampoo and compression socks will be your best friends, and an in-flight beauty regime will make all the difference between you crawling, or strutting off of that plane. I actually wrote part of this post 35,000 feet in the air on my first leg to Dubai, before heading to Perth, and finally on to Sydney. It was a journey that took 30 hours and by the time I sat down on my third plane, I was more then thankful for my only companion – my carry on! This time around I flew with Emirates, who excelled my expectations, so I struck gold with inflight entertainment, comfortable seats and leg room. When it comes to long haul, I definitely recommend spending a little extra and flying with the better airlines. 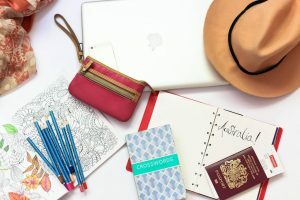 I made a bit of a kafuffle of my first carry on when I headed down under in November, but I quickly learnt what were necessities, and what were just taking up space. Since then my journeys have gone smoothly, with everything I need at hand to feel refreshed, relaxed and ready for an adventure! 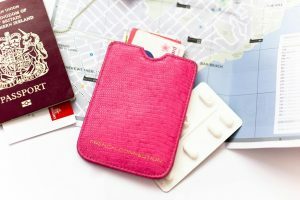 Here are some of my carry on essentials, and tried and tested advice for anyone braving a 10+ hour flight. Before packing, always check what your baggage restrictions are with your airline and your destination. If you’re flying out of London for example, no liquid item should be over 100ml, so it’s a great excuse to finally use all of those lovely beauty samples you’ve been saving! A little organisation goes a long way when it comes to packing your carry on. 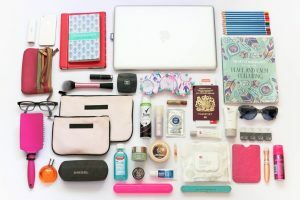 All those little bits and bobs loose in one big case can leave you standing in the aisle, rummaging amongst all of your once neatly folded clothes just for a tiny lip balm, all whilst disturbing the passengers around you. And if you’re a small person like me, there’s only going to be so many times people will offer to pass down your bag. To avoid this, carefully consider what are the essentials, and when you’ll be using them, and pack around that. 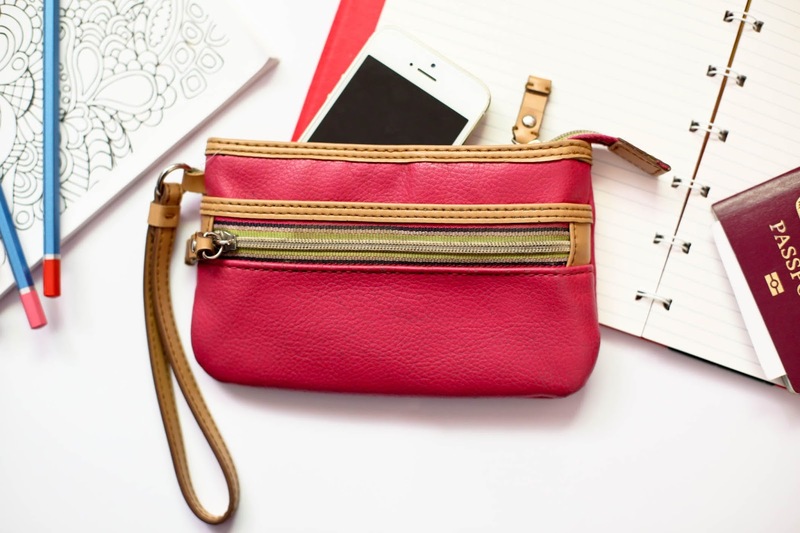 Individual bags and compartments are your friends here. I keep my important documents (passport, visa, tickets etc) in a file that stays safe in my large handbag, along with items that I want access to throughout the flight. These include my glasses, beauty bag, medication, chargers, my eye mask and things to keep me occupied like books and magazines. I keep all of my beauty essentials in two little zip up Narciso Rodriguez bags that were included in a perfume set. 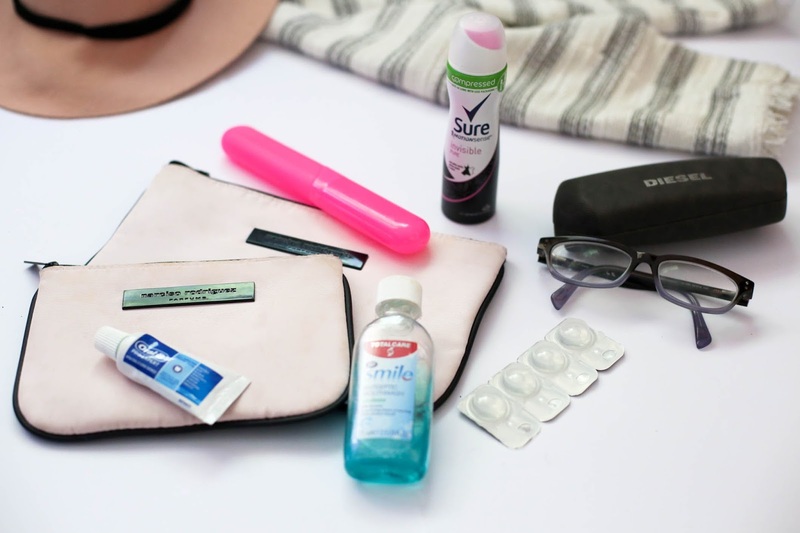 At certain airports I have to empty all of my liquids into a clear sealable bag for inspection, so to make it easier I keep all the liquid items in the larger bag, and ‘dry’ items such as my toothbrush, nail file and compact powder in the smaller one. Once I’m on the flight, both bags come with me to the bathroom and are always in reach when I’m sat down. My case contains everything else, neatly separated into organised bags. There’s a bag that contains my inflight clothes (if I’m not already wearing them), another for destination clothes (I landed in 38 degrees) and one more containing spare underwear and a spare light weight summer dress, in case my luggage gets delayed. Once I get on the flight, I simply grab my inflight outfit bag, drop my neck pillow onto my seat, change in the bathroom and fill the bag with my departure outfit. I also pack a plastic bag to keep my dirty clothes away from my fresh ones. 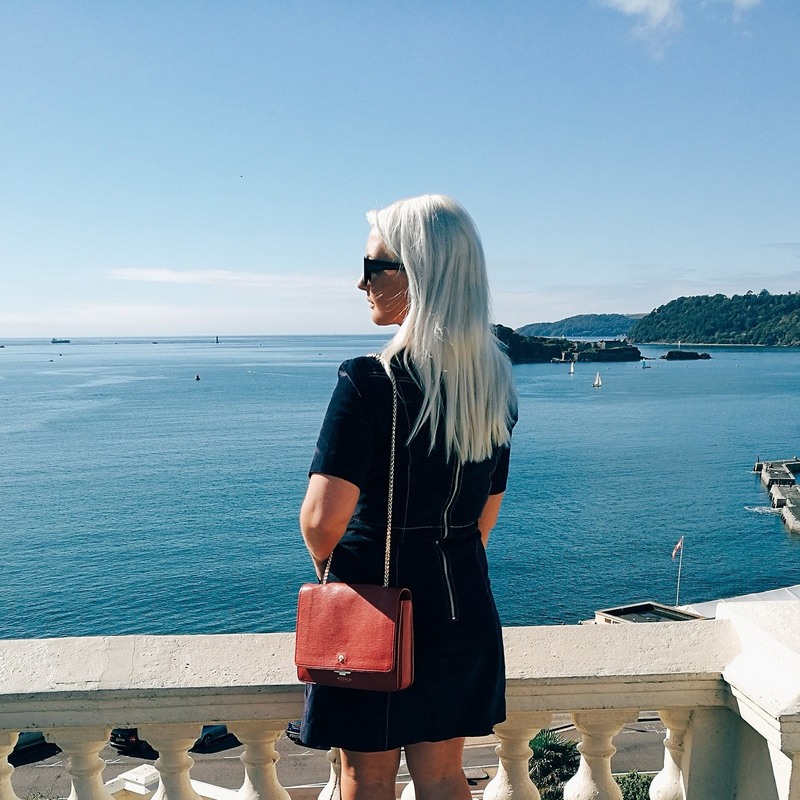 If you’re taking a particularly bulky handbag or everything in one suitcase, its worth packing a lightweight cotton shopper bag to put your inflight essentials in and keep it by your feet. I always pack my valuables in my carry on case to ensure they are with me at all times. This includes my camera, laptop and any other devices, which all remain in their well protected cases. For my trips to Australia, I was allowed to bring on board a handbag, laptop bag and my carry on case. Not every airline or flight does this though, so make sure you check before hand. 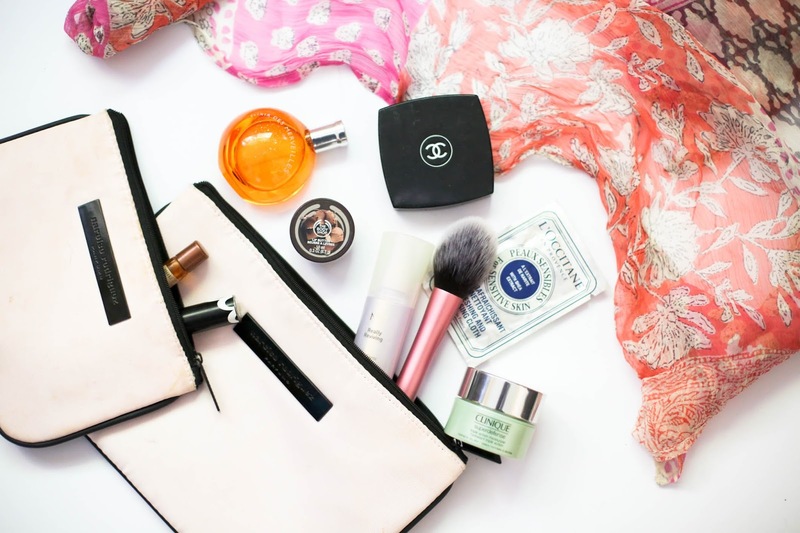 It’s so important to stay fresh throughout a long flight, so don’t skimp on the beauty bag. Flying is renowned for taking a toll on your skin and eyes, so keeping your skin and lips moisturised is all part of keeping you hydrated. I’ll be going through my long haul flight beauty bag and my inflight routine in my next post, but here are some other essentials to keep you fresh. Spare underwear and clothes – Being stuck in the same clothes at airports, or on the last leg of a 30 hour journey is going to make you feel pretty grim. Pack plenty of underwear, and even a second pair of leggings and a loose top for the flight. Fresh clothes will make you feel like a civilised human again! Eye drops – If you suffer from dry eyes, pack a small bottle to keep them hydrated. Eye drops can also help to awaken you after a long, dreary flight. Chewing gum – If there’s a long queue outside the bathroom, and you want to freshen your breath after a nap, then reach for some minty chewing gum. The chewing motion will also reduce any ear popping when the plane takes off and lands. Hand Sanitiser – There’s plenty of opportunity to eat on long haul flights, not to mention all the times you’ll rub your eyes, or touch your face. So to combat any viruses present on the plane, I apply a hand sanitiser on a regular basis. Contact lenses – If there’s one place contact lenses are not your friend, its on an airplane. The air conditioning (just..ouch), intermittent sleep and close up TV screens will be trying for eyes, even without lenses in, so giving them a much needed break will be important for your health above all things. I packed 4 sets of disposable lenses for my last 30 hour journey, including spares if one went astray. I also packed my glasses and case into my baggage. Make sure you come back for my next post all about inflight beauty to see what’s in my beauty bag, what products I recommend and my 30 hour flight routine. Comfort is the main priority when flying, but that doesn’t mean you should just throw all style out of the window and don a tracksuit. Whilst I confess my departure outfit features a smart jacket and heels, once I’m on the plane it’s a quick change into unrestricting leggings, a lightweight top and some comfy slip ons. Following these simple rules, I’ve put together two flight outfits that are both comfortable and cute to get you inspired! Avoid denim like the plague, and instead opt for leggings, yoga pants or loose fitting trousers. 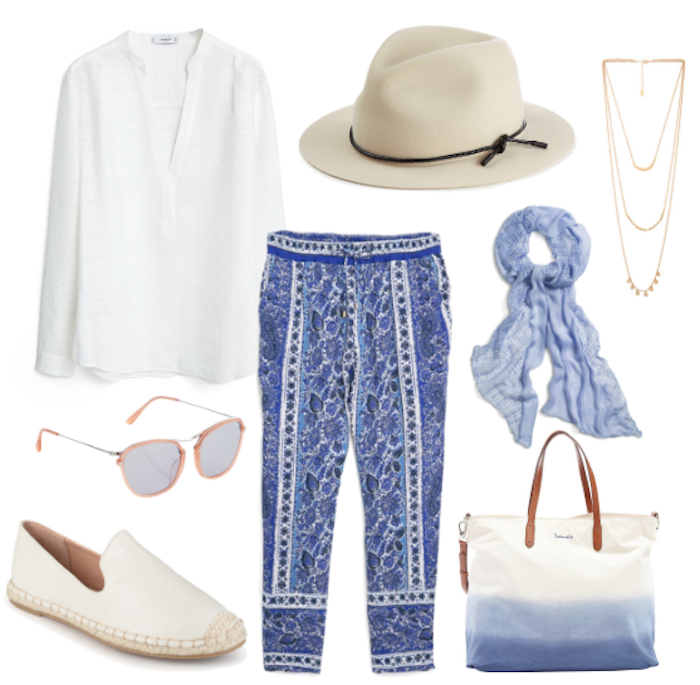 The light weight, harem (there I said it) trousers that are popular amongst boho travellers are the holy grail of comfort! Opt for loose, baggy, cotton tops that aren’t too thick, and if pack a light jumper to throw on if you get cold, or a cardigan. Alternatively you can wear a large, cosy scarf that can be used as a blanket, or bundled up to make a pillow, as well as add style to bland outfits. Hats can be a nightmare to pack, so I find simply wearing one onto the flight and placing it in the overhead locker on top of my case keeps it from getting squashed. As for accessorising, I prefer to keep that to a minimum. Even for my departure outfit, I don’t wear any jewellery, because I’d have to keep taking it off to go through security. If you do want to wear something glitzy, then opt for long necklaces and bangles that can be quickly removed without having to fuss around with fastenings. If you want to wear heels in the airport like I do, remember there’s always a fair amount of walking involved. My terminal always seems to be at the other end of the airport, so I only wear my most reliable, comfiest heels. Remember your feet will probably swell quite substantially after a very long flight, so make sure you’ve got other shoes ready for landing – I couldn’t physically squeeze my feet into my heels afterwards! As for the flight, wear some comfortable, fresh slip ons. To minimalise swelling and reduce the risk of DVT, I strongly recommend compression socks for long haul flights. They aren’t the most stylish of garments, but they are essential for your health. If you suffer from cold feet, also pack some fluffy slipper socks to slip on once you’re sat down. If all my potions and lotions fail me and I still look thoroughly drained, sunglasses are my plan B. Nobody will see those eye bags with some dark sunnies, plus they’ll be one of the first things you need when you land in all that sunshine! At some point you’re going to want to sleep, and you’re going to need as much of it as you can get. 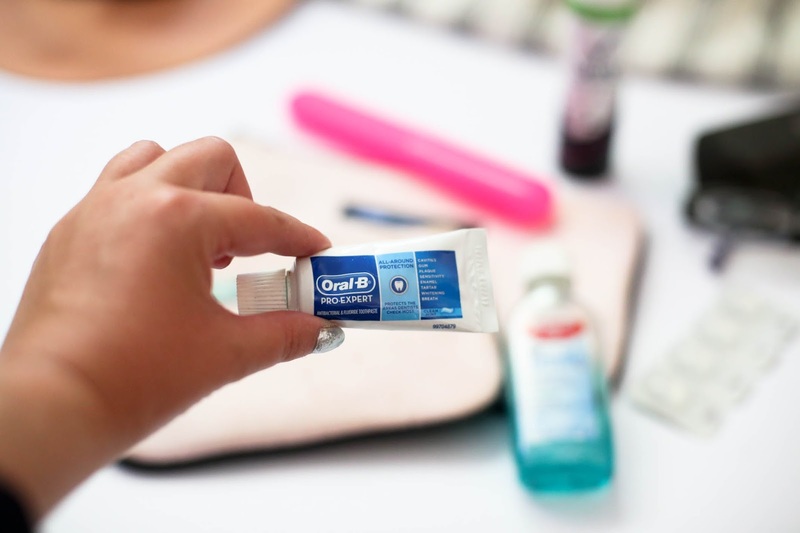 Getting comfortable on a flight may take some time, but these essentials should certainly help. Travel Pillow – These things are a god send, and makes getting to sleep a much easier process. They take up a little space, but are definitely worth it. I love this quirky range of travel pillows from Typho! Eye Mask – Whilst most flights give you an eyemask, I always prefer to have my own. At least then I know I’m the only person who’s warn it and my Typo dream catcher mask is more then just pretty, it’s incredibly soft too. Ear plugs – I’m a ridiculously heavy sleeper so I’ve never had to use them, but it’s always worth having a pair incase you’re sat near screaming children or you’re easily disturbed. They also help to reduce discomfort and popping caused by cabin pressure. There’s plenty of things to do on a long haul flight. Personally, I try to use the time as productively as I can, which is why I keep my Macbook close by. Whether I’m editing photos or writing, it certainly keeps me busy. The entertainment systems on both Emirates and Etihad were fantastic, with an enviable collection of music, a vast range of films and even meditation audio books. Despite there being so much on offer, I like to make sure I’ve got enough things to do for all 30 hours, and I wasn’t bored for a second! 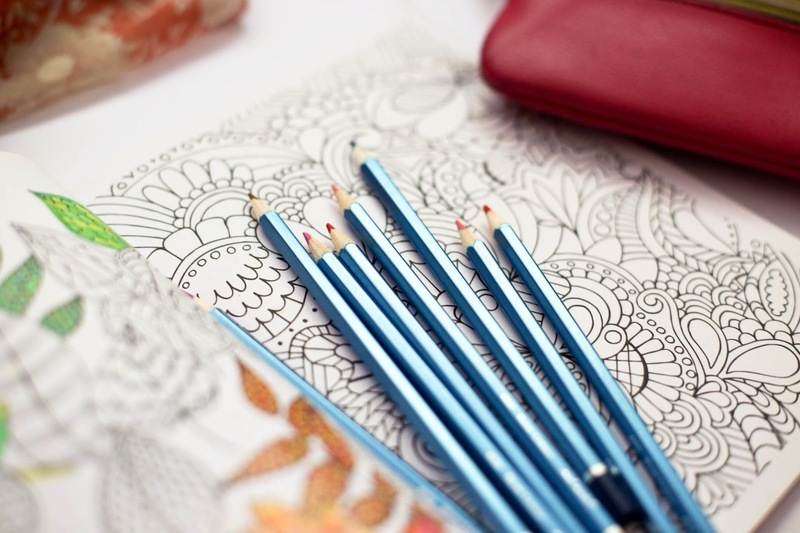 Colouring book and pencils – I don’t know about you guys, but I just love the fact colouring is now a totally acceptable activity for grown ups. It’s relaxing and creative, in a mess-free and pretty stylish way! I kept my current colouring book (yep, I just wrote that in my 20’s!) and a collection of pencils near by if I felt the urge to scribble away. There are also much smaller, postcard colouring books if you don’t want to take up to much space. Reading book – There’s enough time on long hauls to watch a few films AND get stuck into a book. Treat yourself, mix it up a bit. Ipod – Most good airlines have a vast selection of music to listen to on the flight, but I always pack my ipod filled with favourite tracks for the hours spent waiting in airports. Magazines – Fresh reading material gives me another thing to look forward to on the flight. Look out for the compact versions of fashion and lifestyle magazines for sale at airports. 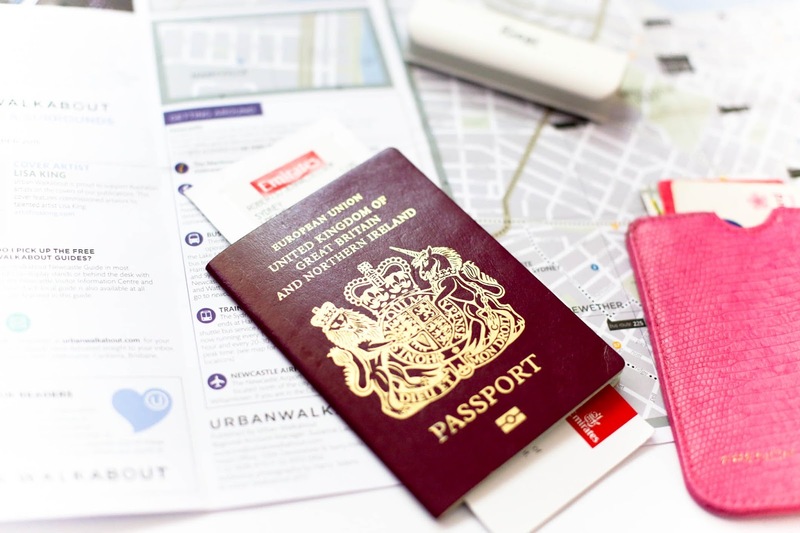 Passport, tickets and documentation – Obviously, this goes without saying. 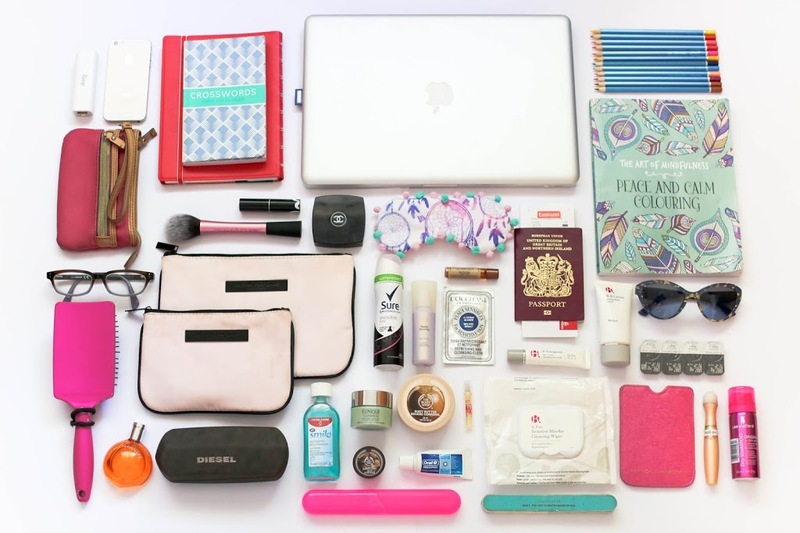 Your face spritz, calming playlist and new silk eyemask are all pointless if you forget your tickets and passport. I keep all of my travel documentation in a single folder, that is easily accessible for when I’m going through customs. 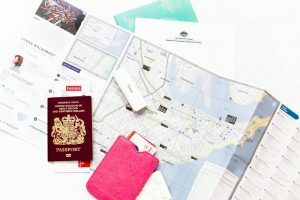 I also print off travel insurance documents, visas, flight information, contact details and destination addresses to ensure my trip goes smoothly. 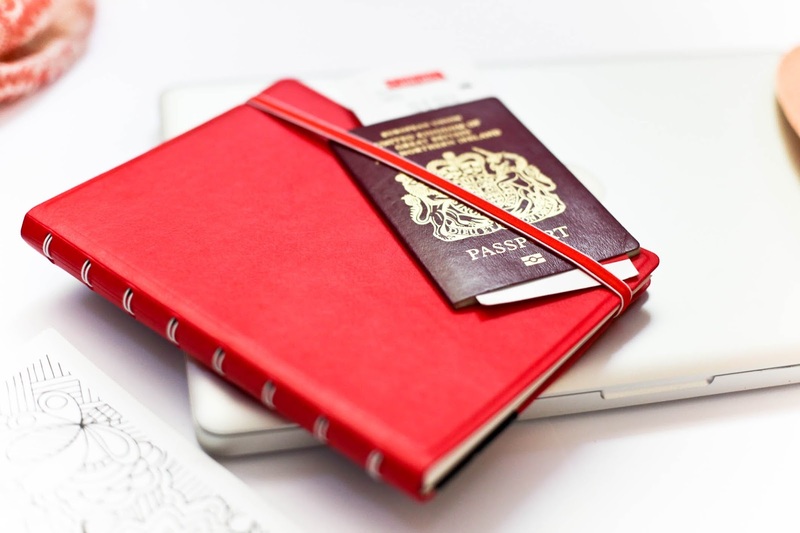 Phone, Ipad and Laptop chargers – Good airlines will let you charge your devices on the plane, so it’s a good idea to keep all your chargers with you. Even if its not an option on board, charging it at the airport and letting family and friends know you’ve made it to your next stop is a worthy reason to take it. Some baggage checks require you to turn on your laptop and devices, and will confiscate electronic items that don’t switch on. A drained battery and no charger could leave you in a pickle, so don’t leave it to chance. Medication and the contraceptive pill – Check with your airline to see if and what the restrictions are for bringing pills on board. I always pack some pain killers incase I’m cursed with a persistent head ache mid flight. I also recommend packing extra prescription medication, such as the contraceptive pill incase one goes missing, or your luggage goes missing or is delayed. Thanks a lot for sharing these tips!